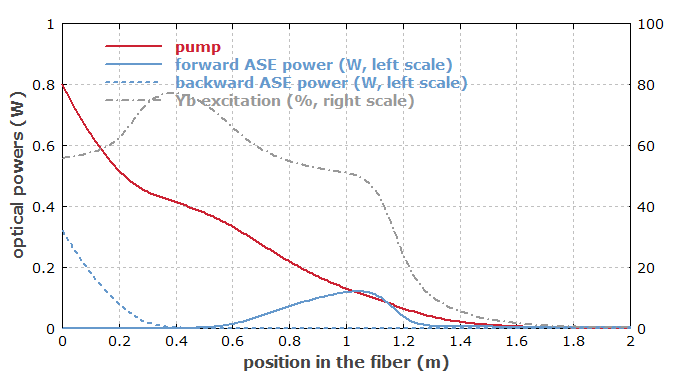 Abstract: Numerical simulations on a simple fiber amplifier exhibit various rather surprising phenomena concerning amplified spontaneous emission (ASE). This can all be understood based on the numerical model, which calculates not only observable quantities but also everything which happens inside the fiber. Numerical modeling can be recognized as the best way to acquire a thorough understanding of lasers and amplifiers. Imagine that you have an ytterbium-doped fiber amplifier, where you suddenly switch on a constant pump power, and there is no signal input. What would you expect for the time dependence of the amplified spontaneous emission (ASE)? Probably nothing particularly interesting: presumably, that the ASE power is initially extremely weak and then monotonically rises, finally approaching a certain steady-state value within a time which is a few times the upper-state lifetime. 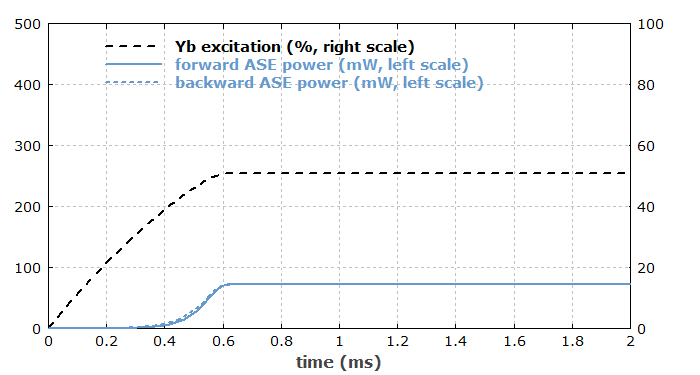 It is quite surprising to see that after half a millisecond, the backward ASE power has already reached ≈86% of its final value, whereas the forward ASE power has just started to come up. So the ratio of forward and backward ASE power changes enormously with time. 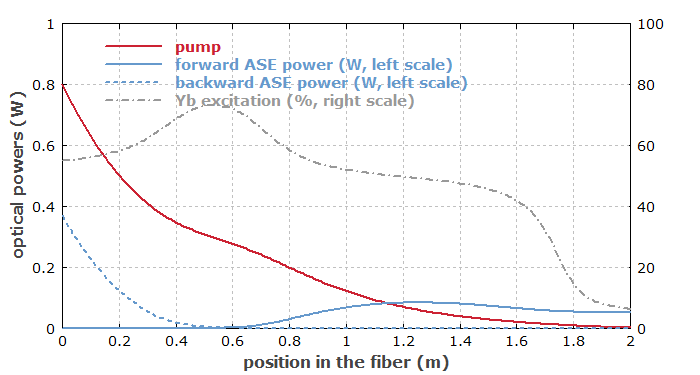 One can see that backward ASE comes up only quite close to the left end, whereas forward ASE (going from left to right) gets strong in the middle of the fiber but is then mostly reabsorbed before it reaches the right end. 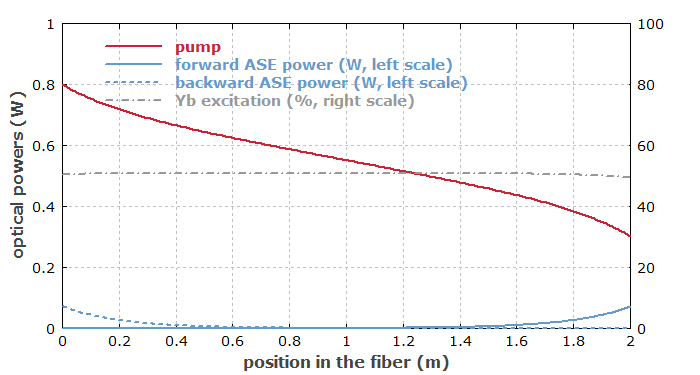 This is because the pump power is largely exhausted in the second half of the fiber, so that the ytterbium excitation is low, and the ASE – arising mostly around the strong emission and absorption peak at 975 nm – is strongly reabsorbed. The ASE powers also act back on the ytterbium excitation (via gain saturation), which now leads to a strong spatial dependence on the absorption coefficient for the pump light – which in turn explains the strange position dependence of the pump power. Because overall the ytterbium excitation occurs mostly in the left half of the fiber, the distribution of ASE powers between forward and backward direction is strongly asymmetric. Essentially, backward ASE can profit from significant fluorescence light being generated in the right half (despite negative net gain), whereas forward ASE cannot profit from such an effect. The less asymmetric distribution of the ytterbium excitation then also makes the ASE power distribution between forward and backward direction less asymmetric. The ytterbium excitation now stays nearly constant at ≈50% throughout the whole fiber, because at 975 nm the emission and absorption cross sections of Yb are both very large and approximately equal; we are in a strongly saturated regime, where a high absorption and stimulated emission rate work against each other, and spontaneous emission and ASE are not very relevant for the Yb excitation. 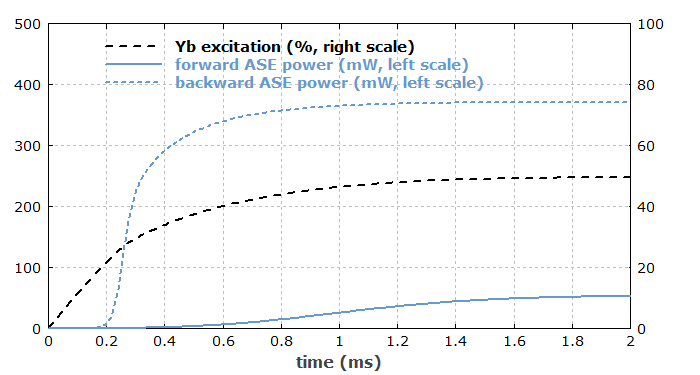 The highly symmetric profile of the Yb excitation leads to nearly identical ASE powers in forward and backward direction. An inspection of the ASE spectra (not shown here) shows that the ASE is now mostly around 1030 nm. Working Without a Numerical Model? The shown examples demonstrate that the behavior of such amplifiers is rather complicated – even though I have chosen a really simple case: a single-mode fiber doped with ytterbium, having only two relevant level manifolds, a single pump wavelength and no signal input. It is quite clear that without numerical modeling most people would be confronted with absolutely surprising observations which would make no real sense to them. Under such circumstances, it is hard to either efficiently optimize the operation parameters of an amplifier product or to do proper scientific research; both simply need more insight into what actually happens. 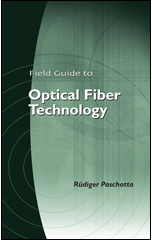 A numerical model is by far the best tool to get there; it calculates not only what you can easily observe, but also much more (e.g., what exactly happens inside the fiber). I like to say “a model is transparent” – you can look into everything. You can now easily guess how I myself acquired a very detailed understanding of lasers and amplifiers: by playing with various models and inspecting their results until I understood everything. One could never get there just by reading textbooks or papers, or by building such devices. Therefore, I also warmly recommend numerical modeling as an excellent tool for educational purposes.